Some companies call them HERO awards, others Rippas or Hugs, we call them Kudos. It is a written and public recognition of a colleague for something she has contributed to the team. A Kudo is not just given from the top down, but peer-to-peer and bottom-up. Across departments and organizations, anyone can recognize someone else’s work. It’s a way to break down hierarchical limitations and to encourage everyone to offer instant positive feedback. Kudo Cards are simple cards that play the role of a physical token of appreciation. The cards can be placed in a box, and every now and then the Kudo Box is emptied and the workers celebrate those who had received a card. Maybe once per day, or once per week, the implementations vary across organizations. Incentives ensure that people stop doing things just for the joy of the work, but rewards that trigger intrinsic motivation are more effective, most sustainable, and usually cost less money. Rewarding your employees based solely on outcomes is not sustainable for your company in the long run. Managers often use this type of extrinsic motivation (money, grades) when they want people to work harder, longer or more effectively. This is dangerous and often kills intrinsic motivation. While failing to pay your employees on time is a sure demotivation, today’s workers are more motivated by internal motivators. Learn more about Rewards & Incentives in the Management 3.0 Plus Module as well as the view Energize People with its main module Motivation and Engagement. At the beginning of the meeting, I explained what Kudo Cards are and invited them to transform their previously written notes in these tokens to recognize a valued work that was made by them. Thirty minutes later, we started to deliver the cards, and we had a very special moment remembering how each of us contributed to the success of the project reinforcing how each team member is important in this journey. By now, all team members have access to Kudos to deliver to a peer whenever they want. The culture of to praise a good job was increased and we are witnessing even more happiness in our work days. And now we also have even more beautiful desks too. The Management 3.0 Practice of Kudos is fully focused on intrinsic motivation brought on by all team members, not just top-down bonuses, and it’s a way to write thank you notes and other notes of acknowledgement. Get people to say, “thank you” in a way that has meaning for both the sender and the receiver of the compliment. What is the Kudo Box? While some companies are creating a wall of kudos, proudly showing all the time, others are looking to build a “shout-out shoebox” or a kudo box, in which they store the kudos and then have monthly or so celebrations, where they read out the kudos. Others choose to turn the Kudo Box into a raffle, giving away Starbucks giftcards. The science of positive psychology confirms that positive minds are more productive and more successful than neutral and negative minds. And systems thinkers and complexity researchers know all about reinforcing feedback loops: you often get more of what you focus on. Therefore, focus on the positive, not the negative. In other words, it all makes sense. At Softonic we have a recognition system based on a web application that does not allow for anonymous comments. We have seen that this doesn’t always suit everyone, especially in the technology department. For this reason we’ve decided to launch the Kudos Box in order to make recognition more tangible, personal and anonymous for whoever may prefer it this way. 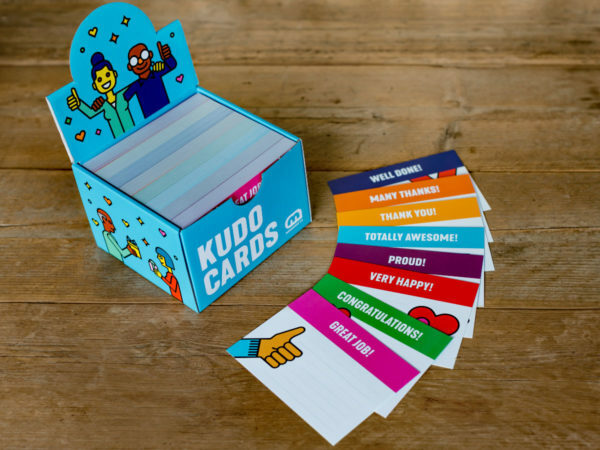 Every week we’re going to open the Kudos Box and celebrate the moment by handing out Kudo Cards. As Jurgen Appelo said, “Teamwork can only emerge as an outcome of people’s individual contributions to that team.” Kudos recognize the individual accomplishments that combine to make a successful team. Buy your own deck of Kudo Cards today! In our Management 3.0 shop Kudo Cards are available in English. If you require another language you can download them for free, print and cut yourself. Download the Management 3.0 Kudo Cards to print and cut it yourself. Please note: Re-selling is not permitted. In exchange for your free download of Kudo Cards all we need is a bit of information from you and permission to contact you in the future. At some companies, those who received a compliment from a colleague can choose a little present such as a dinner for two, a movie ticket, or box of chocolates. At other companies, there is a draw of the kudo cards, and the winner gets a slightly bigger prize. And I’ve heard of businesses where, instead of little presents, the employees simply bask in the glory of their fellow worker’s appreciation. But no extrinsic rewards are handed out. To get other people to write kudo cards, it helps to make the practice as visible as possible. Make sure there’s no way for people to ignore the box or the cards. I’ve heard of companies placing the box strategically near the coffee machine. Others have decided to make a kudo wall in a central corridor where everyone sees the cards several times per day, each time they pass by. And of course, offering little presents may help to get people to adopt the practice. The extrinsic motivation is probably small enough not to hurt anyone’s performance, but it may be large enough to grow a culture of appreciation and positivity. Have We Forgotten to Say Thank You?